Thanksgiving isn’t only a time for too much food and merriment. If you make the time, this holiday can also be filled with gratitude. For families trying to ensure a thoughtful future generation, it’s an opportunity to think of others first. And if you’re simply trying to start your charitable New Year’s resolutions early, you might find this list a great place to start. Getting out of bed on the right foot allows you to offer your best self to those around you the rest of the day. Even if you have an early alarm set for starting the turkey, try to take a few minutes to check in with yourself. List a few things you’re grateful for. Take some deep breaths. Smile. Just make sure you set a second alarm — just in case. The idea here is to get yourself prepared for whatever the day will throw at you. Don’t let burned stuffing or a missing can of pumpkin throw you off. Plus, it’s easy to get overwhelmed by expectations at the holidays. 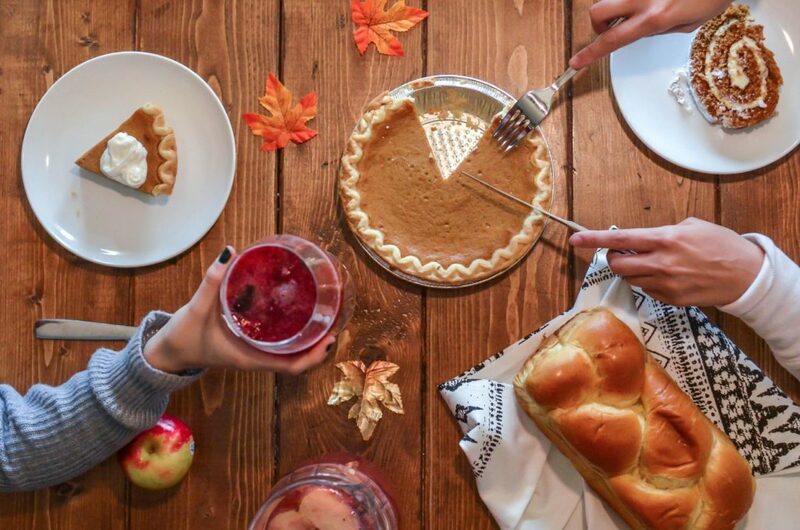 Being proactive about your mental health is a great way to combat stress at Thanksgiving. It’s so easy to want to make sure a Thanksgiving spread is perfect — and abundant. The truth is that plenty of food ends up going to waste on this holiday. While post-Turkey Day leftovers are a common tradition, many family don’t enjoy endless days of it. Really take a look at what you need, and remember that running out of a certain dish isn’t the end of the world. Ask each person what they actually enjoy eating, and think about skipping the rest. You may find yourself cooking a significantly smaller turkey, or skipping the pumpkin pie. If you have extra ingredients that remain unopened, consider donating them to a food bank. While this bird is a big part of the Thanksgiving tradition, it can also be the most polarizing. With more vegetarians than ever, the likelihood that you’ll have one at your table is higher this year. Plus, many more meat-eaters simply dislike this notoriously difficult-to-cook dish. If this sounds like your family at all, how about a different protein at the Thanksgiving table? Tofu takes flavors well, and tempeh can make an interesting substitute. If you want a big wow-factor, a mushroom wellington will certainly fit the bill. When you’re all seated around the table, it’s easy to just slip into your chair after all the cooking is done and dig in. What if you started out the dinner with a little bit of gratitude instead? It can be what people are thankful for that day, that year or in their entire lives. Most kids and many adults get Thanksgiving and the following days off from school and work. What if you took that opportunity to volunteer? For children, there are plenty of opportunities at places like food banks and animal shelters that are age appropriate. Nursing homes are especially great places for little ones to spread the love. Even writing a letter to a soldier or sending a card can be sweet during the holidays. If your family regularly donates to charities at this time of year, you could offer to let kids choose where that money goes. It’s a great way to engender the charitable spirit early on in life!